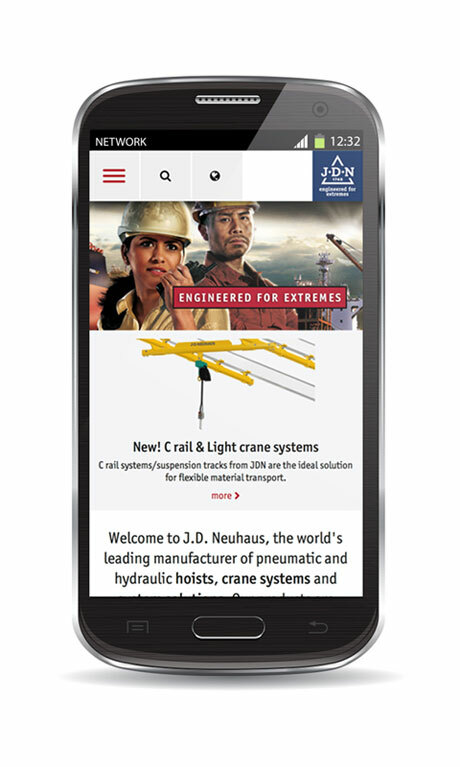 As the leading German manufacturer of pneumatic and hydraulic hoists and crane systems, the J D Neuhaus Group (JDN) has improved their innovative website. Their well-known address www.jdngroup.com incorporates many improvements. It is more user-friendly, more informative and better structured, while being technically and graphically optimised, to represent state-of-the-art operation. Conversion to a responsive web design enables the content to adapt automatically to the size of the screen being used, and the whole content can now also be viewed more efficiently on tablets and smartphones. The horizontal navigation has also been reduced to emphasise the menus for Products, Service and Company. 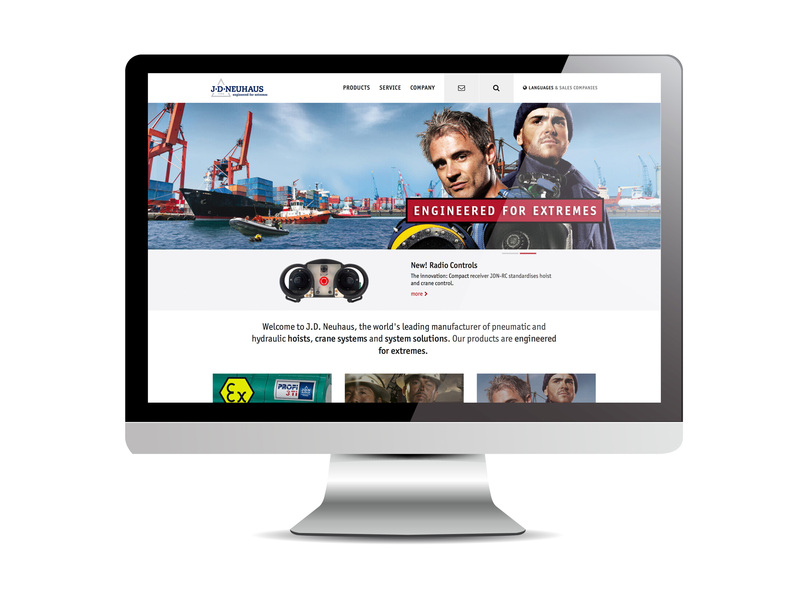 As the Service and Company sections of the site had already been re-launched towards the end of 2016, the website now presents itself with a modern look, feel and operation in a full screen mode. Also new is the News Slider on the homepage and underneath, the most important image themes of the JDN Group will be presented. At its state-of-the-art facility in Witten, Germany, J D Neuhaus produces pneumatically and hydraulically-operated hoists and crane systems with over 200 employees across the group. Thanks to this globally unique specialisation, J D Neuhaus have not only set the quality standard, but are also the world market leader with customers in more than 90 countries around the globe. The products particularly set themselves apart with lift capacities of up to 115 tonnes and their resilient and reliable operation, including protection against explosions even in the most extreme operating conditions. 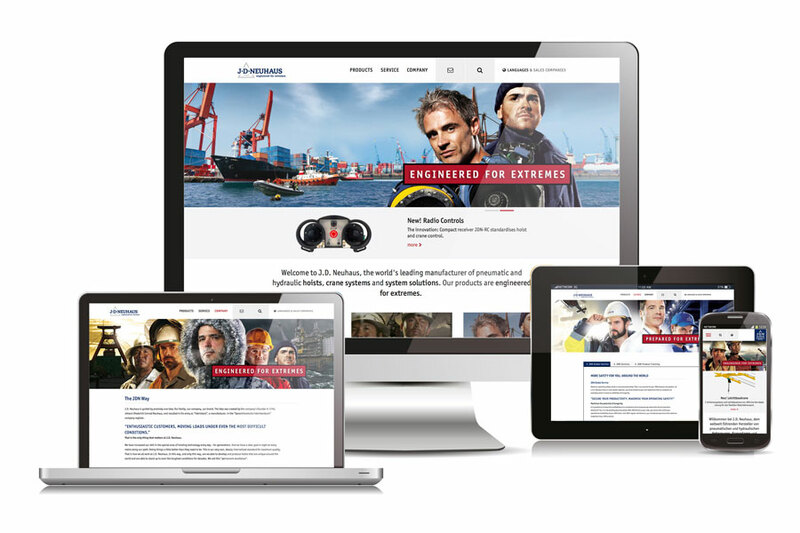 Typical examples include oil and gas exploration in arctic temperatures as low as -45°C; the undertaking of underwater repairs on ships; as well as in mining and the chemical industry, together with heavy plant construction and in many areas of logistics. J D Neuhaus supplies around 70 branches in total worldwide. Production takes place exclusively at their Witten plant. The broad range of services provided includes equipment assembly, inspection, maintenance, and general overhaul, as well as running courses for customers. For distribution, JDN companies located in France, Great Britain, Singapore and the USA have created a tight-knit global network, and in collaboration with international partners, have supported an export rate of over 80%.